Season 9 Episode 1 Scrounging for Seeds Discussion Thread! Mission was great but slightly hard... LOVE IT! Wow, @Pain_Walker has pinning powers? Man, shoulda just pinned the previously created one. Can anyone explain the one hour cool down on season missions? Why wouldn’t 10 minutes suffice? The second mission (Hard) with the crew you are given was the hardest one. Once I got past that, it was mow 'em down with my Assaults. I did throw in a Hunter for the last couple to take out the Fattie. Just take your time and charge up when you open the doors and when the spawn waves come in. Why is there a refresh timer on the Trade shop? If I have the tokens, why can't I get a refresh sooner? Why can't I buy bundle after bundle after bundle? If I want to throw thousands at the game, why do I "run out" of items. It's not like I'm handing them off. Why am I limited on the amount of badges I can create and hold? If I have the components, fragments, and tomatoes, shouldn't I be able to create as many as I want without trashing some? Governator, try a loaded warrior team. The second mission (Hard) with the crew you are given was the hardest one. Once I got past that, it was mow 'em down with my Assaults. Boy, ShadowaceAz sure taught me a lot. Eternally grateful for the education and productive contribution to this thread. Cool downs are supposed to cut down on burn out, keep you coming back periodically for more gaming. If you complete everything in one quick go, and don't need to come back for a week... Increases the likelihood you won't come back. Longer away, more chance you'll find something else to do with your time? If you complete everything in one quick go, and don't need to come back for a week... Increases the likelihood you won't come back. Sorry @There4IM, just couldn't resist tossing NG logic as a solution. How many licks did it take @ShadowaceAz? Carol Rosita and a shooter. Was my team setup. Ez pz. 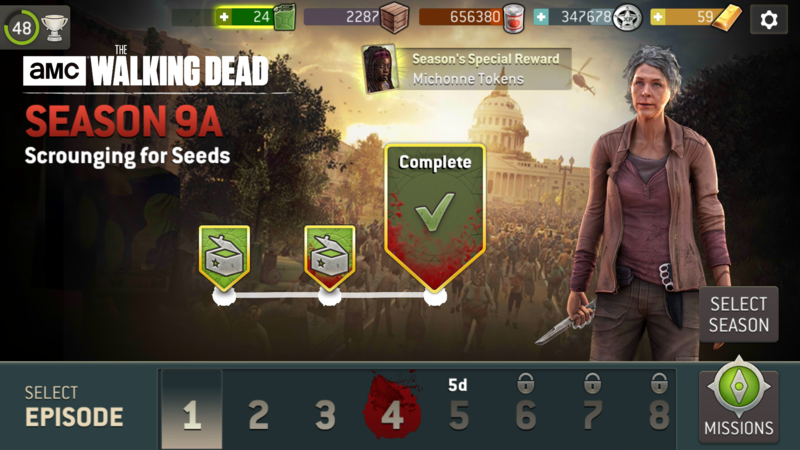 love these missions as farming opportunities...Glen led the way, Abe provided cover, and Maggie slayed the heavies and armored on their backs! fought till 100 were ENDED! A short mission but quite a fun one. I am still confused as to why we are getting regular Daryl tokens for the season's reward? Daryl is a common survivor so we should all have lots of his token by now. Why couldn't it be someone like Rosita/Maggie/Gabriel?